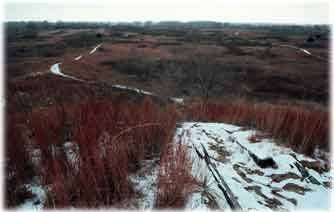 For a quiet, tranquil visit with nature, this 1,123-acre natural area provides a panorama of sand dunes, prairie, woodlands and wetlands and offers hiking, nature and horse trails. The natural setting is ideal for watching colorful Kansas sunrises and sunsets. Archery and upland game hunting is allowed by special permit.